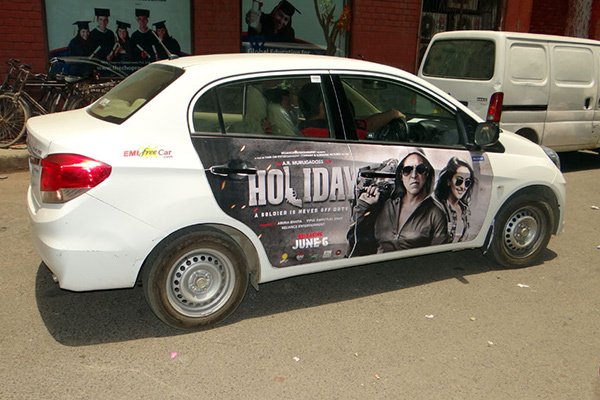 Avail our advertisement on taxi service in Ahemdabad and increase the recognition of your brand with every mile driven. Taxis in India have skyrocketed in the past few years and to advantage the same, we have come up with the advertisement on taxis concept to take your brand to the deepest area of the market and thus cover highest possible audience. The availability of our advertisement on taxis at the cheapest rates has given us the utmost popularity among the consumers as best outdoor advertising company in Ahmedabad. Our advertisement on taxis have proven to be an extremely effective medium of the branding that travels to every footfall locations in the city and generates the highest audience, be it airport, restaurant, hotels, shopping malls, railway station, bus station, schools, colleges, what we guarantee for is the highest broadcasting of your brand 24/7. It means one taxi advertisement, you can convey your message to the highest possible audience, which makes your branding cheaper yet effective. We have been providing the advertisement on taxi service for the long ago, and holds a high number of taxis to advertise your brand to at best and give you the advantage of brand recognition and brand recall at once. We know how to entice consumer through the moving taxi and hence confident about making your brand dominant even in the crowded area, which has greater potential to reach a high volume of audience versus TV and radio advertisement. Further, our creative & high-resolution color advertisement on taxis makes it more distinctive, intrusive, and attention grabber for your product/service. Give your brand sky scraping popularity by capitalizing our experience and power of taxi mobility today. Almost 2000 miles per week is every taxi traveling, and spending 90% of their time in town and cities and hence broadcast advertise across thousands of people every day, thusly promise for high volume audience coverage. The motion attracts more consumers and teaming with bright colors gives it that extra force to drive highest number of consumers. Taxi goes where people, be it a shopping mall, railway station, airport or bus stop, taxi circulates every place as people and hence make your brand reach to largest to the narrowest street and create a notable buzz in regard. The single taxi broadcast your advertise to every place of the city and promise to grab the highest attention through the power of motion that no other medium can at the cost taxi can and hence is proven to be a cost-effective approach.